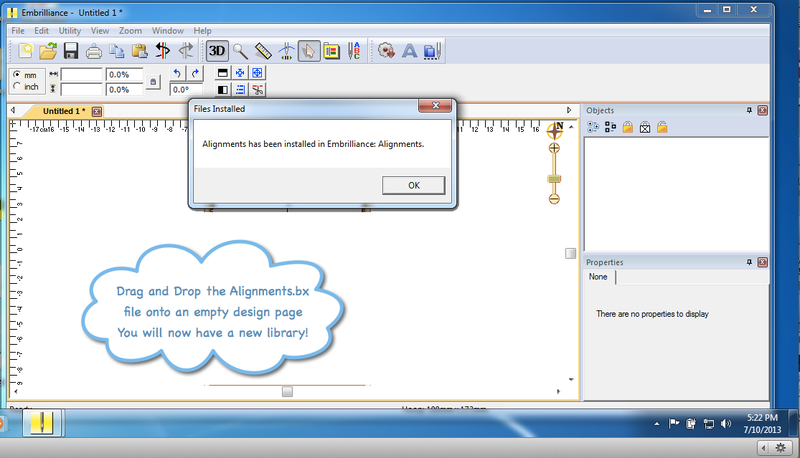 In a previous post about lining up two or more designs in Embrilliance Essentials, I provided a zipped file with the alignment lines in it. This did get me thinking….”wouldn’t it be nice if there was a library available of various types of alignment stitches right in the program?” I happened to mention this to Brian Bailie and I would say within 5 minutes he sent me this file and said “will this work?” So we did some tweaking and and testing to make sure there were no serious issues on my computers and we are now ready to let you guys test it if you want! So how do you get this library of alignments? Download the Alignments.BX file from the link below. 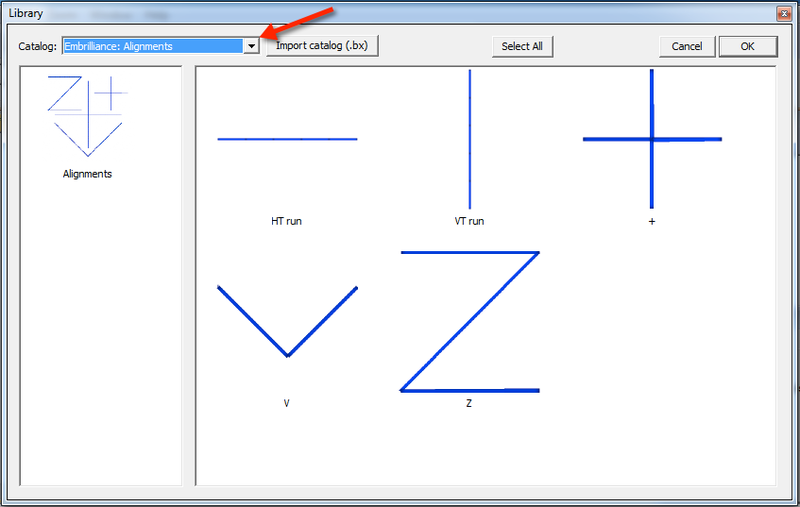 YES, if you have purchased alphabets from your favorite digitizers in the BX format, you know exactly what a BX file is! Its like a design file with an installer included in it. For more information on BX fonts, visit this blog post. In short, A BX file can contain a pre-mapped alphabet collection OR a set of embroidery designs. 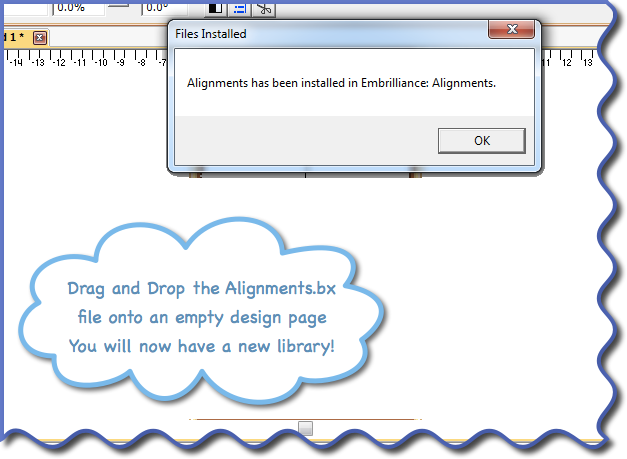 So basically, the BX file is an installation file to add fonts or design libraries to the Embrilliance software. So now you go up to the little gear button – where you would normally get your built in library designs…. You can add these to your designs just like you would any of the library files! If you want a center crosshair to stitch in the center of you hoop first (to put a cross on the stabilizer at the center of your hoop) insert the cross and make sure it stitches first! How do you know it stitches first? look at your object pane list and move it to the top of the list! You know I love to use alignment lines to line up designs because they are the most accurate from a mathematical point of view. Some people have trouble making the alignment lines longer – remember you can type in values on the menu bar to change the size of a selection. Because there are many different types of alignment objects that people are familiar with, we put a whole bunch of them together in this library – you choose which you like to use to get the best results! And yes you can resize these in the software. To all of you that have shown your support for me and my blog and videos by using my affiliate link to purchase the Embrilliance software – THANK YOU very much! So – here’s to lining stuff up! Look for some future posts that talk about using my favorites!